2019 Apple Festivals in Virginia - Where, When and More to Find an Apple Festival Near You! Looking for a apple festival in Virginia in 2019? (just scroll down the page)There is no other listing as complete and current as this list, just updated! All the apple festivals in Virginia we can find are listed on this page! If you love strawberries, look for a festival near you below! And I'm always looking for more apple festivals! Please write me, if you know of any to add! I update the dates as soon as the festivals publish their information, but you can always click on the links (usually the name of the festival) to see the current information on the festival's own website. Apple-Butter-Making Festival, Flippen-Seaman Orchard, Nelson, VA. Phone: 804-277-5824. Event dates: In October, call or see their website for this year's dates. Boones Mill Apple Festival, Boones Mill, VA. Phone: 540-334-5975. Event dates: In September, call for this year's dates. Carter Mountain Apple Festival, Charlottesville, VA. Phone: 804-977-1833. Event dates: In October, call for this year's dates. Chilhowie Community Apple Festival, Chilhowie, VA. Phone: 540-646-8213. Event dates: In September, call for this year's dates. 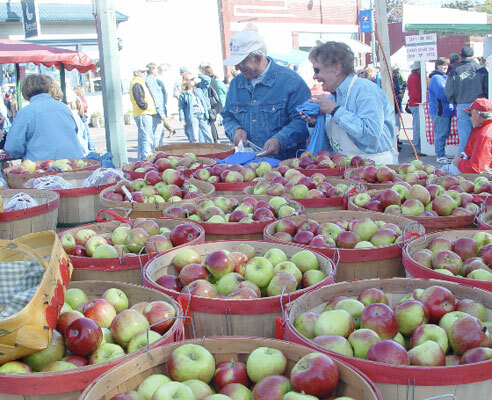 Graves Mountain Apple Harvest Festival - 2 weekends in October, 10:00AM-4:30PM Daily, Rain or Shine. Graves' Mountain Lodge Inc., Route 670, Syria, Virginia 22743. Phone: 540-923-4231. Fax 540-923-4312. Over 65 Arts & Craft vendors, as well as Graves Mountain Food, Hay Mountain. Free Admission / Free Parking. Come and see nature's way of blanketing the mountains with stunning color during the month of October. Enjoy fun filled days complete with good food and entertainment including bluegrass music, cloggers, arts and crafts, hayrides and horseback rides. Experience the days of yesteryear watching apple butter and Brunswick stew being cooked in kettles over and open fire. Our orchards are open for apple picking or you may select your own from the apple bins at the picnic pavilion. Visit the farm and the animals. Markham, VA. Sponsored by Stribling Orchard, providing the site of the Annual Leeds Apple Fest. Hot dogs and ice cream, see apple butter being made in a huge copper kettle, live music, face painting, pony rides, wagon rides, craft shopping, and civil war living history displays. Winchester City Park, Winchester, VA. Phone: 540-662-3996. Event dates: In September, call for this year's dates.